Educators, principals, human resources, registrars, cashiers, and other personnel work in schools. There are actually a lot of different work to be done in schools other than teaching. Just like other companies, employees get hired and employees resign in the school setting. 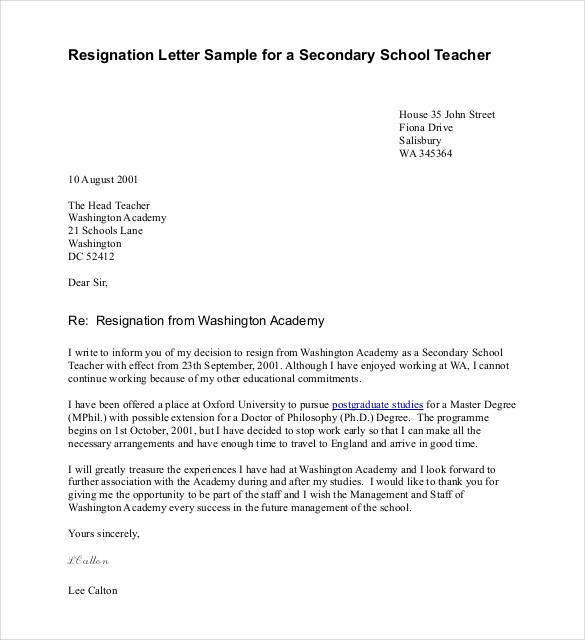 A resignation letter is a common tool used for any profession. 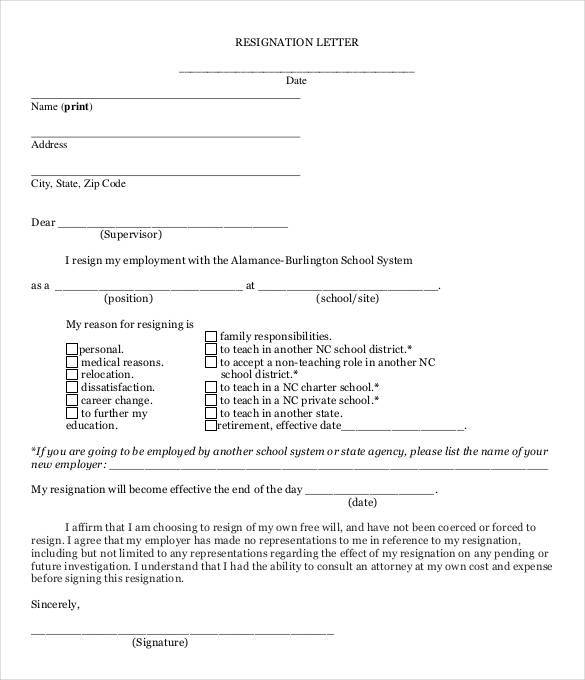 In this article, we will be focusing on resignation letters, specifically those used by people who work in schools either public or private. A variety of resignation letter samples and templates have been incorporated to further help you understand what it is. Other useful information are also provided for your convenience. Resignation letters may seem to be used for the same reason, which is to resign or leave one’s position in a company, but its contents still differ from one individual to the other. That is why different resignation letter samples and templates are made available online to best fit every individual’s needs. 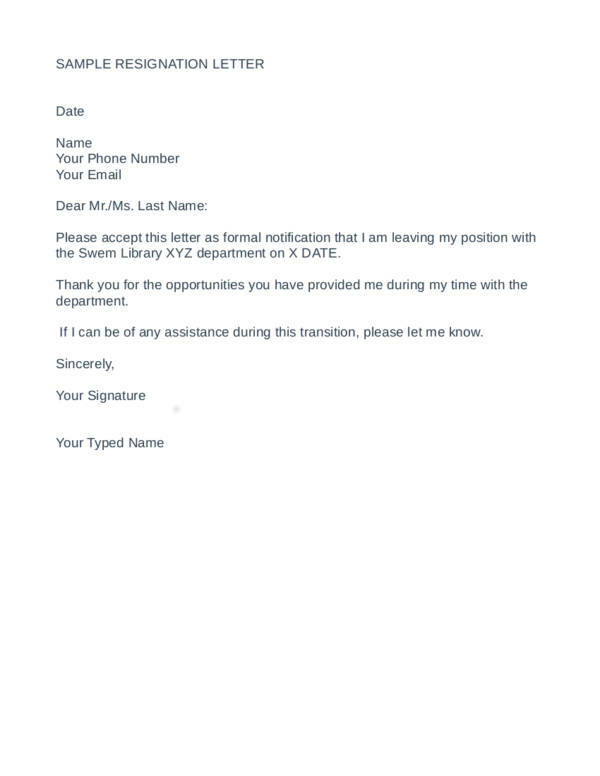 The following are some of the uses of resignation letter samples and templates. 1. We all need a guide on just about anything that we do, regardless if we are just starting to learn about that something or even if we are already familiar about it. Resignation letter samples and templates serve as a form of guide for anyone who wishes to learn how to create one. You may also see sample business proposal letters. 2. 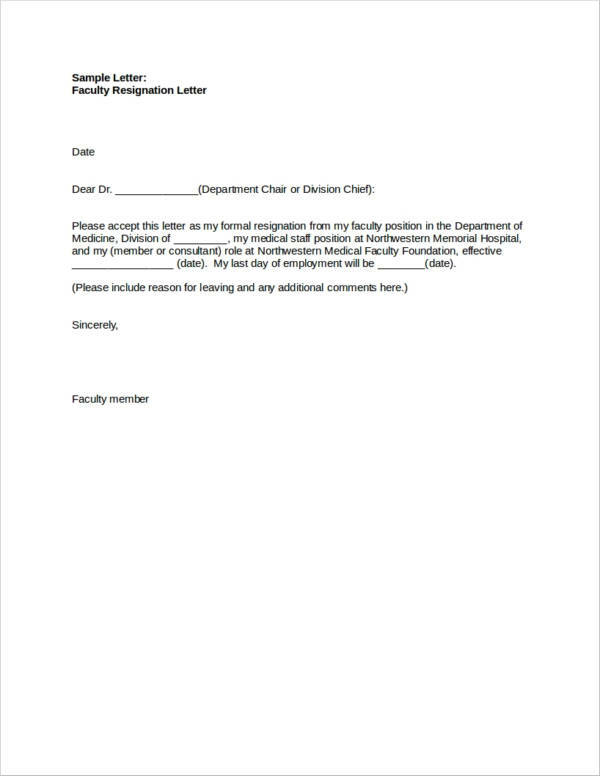 Every sample and template has its own unique statements and reasons that anyone can use or copy for their own resignation letter. 3. 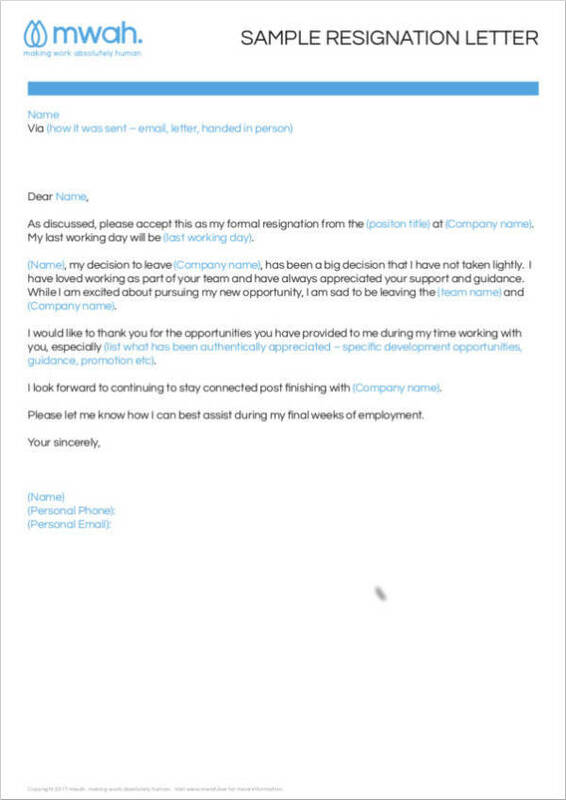 Resignation letters serve as a notice to one’s employer about their plan to leave their position in the company. It allows the employer enough time to look for their replacement so that the company’s operations may not be affected. 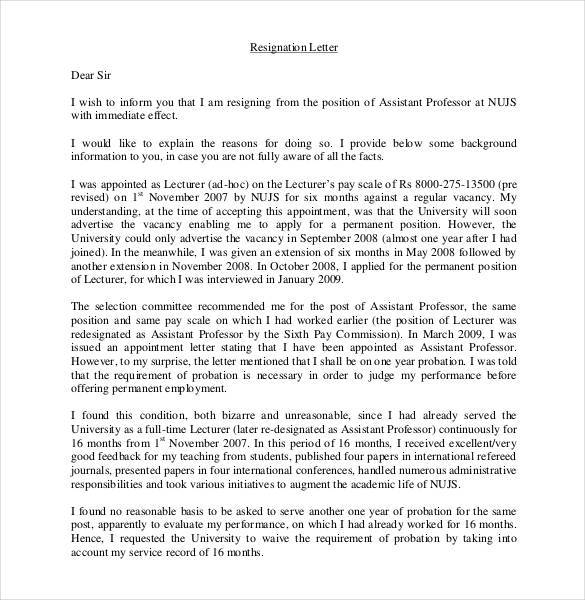 You may also like appreciation letters in pdf. 4. Resignation letter samples and templates are always written in formal letter format so whoever uses them is guaranteed to create one that is presentable. 5. Resignation letter samples and templates are used to easily and quickly create resignation letters anytime one wants to do so. 6. Resignation letters are kept on file by companies or employers as important documents that serve as documentation that an employee has properly notified them that they are leaving their post for such reason. It also signifies that the company or employer has accepted their resignation. 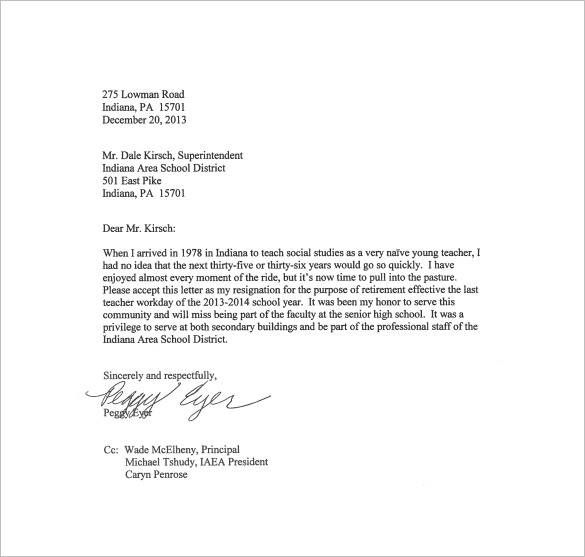 Scarcity has never been an issue when it comes to resignation letter samples and templates. It has been around longer than we could even imagine. These documents will forever be in demand because people will always continue to seek better, or the best, employment. 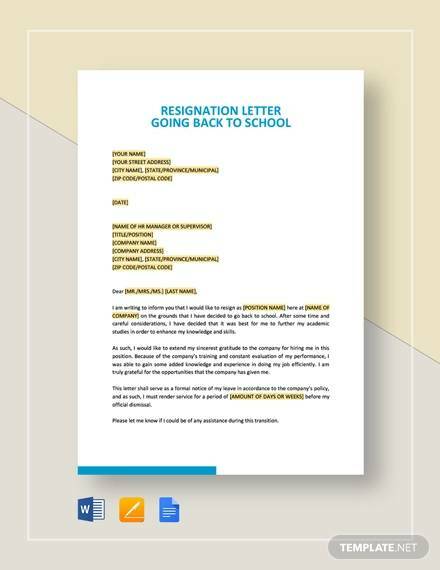 Check out some of our resignation letter samples and templates, like short resignation letters, resignation letter with regret samples and templates, and church resignation letter. Have you ever wondered why people who are already successful or those who have climbed up the ranks in a company still decide to resign from their positions? Why would they do that? People are put in different situations and they handle things differently. Your dream job may not be the dream job of another. Similarly, people resign for various reasons. It is important that companies or employers know and understand the different reasons their employers leave because this will help them make improvements and prevent further attrition. The following are the reasons why people resign. You may also see sample business letters in pdf. A lot of people would want to get a new job, especially if they already have a job offer for it. Who wouldn’t want to work for a new and better job, right? Some people work for such job, even if it is not in line with what they really wanted, because it was the job available to them at the time. When they get a chance to get what they want, they would really go for it. Moving to a different place or country is one of the reasons why other employees resign from their post. It could either be a personal decision or a decision that their whole family has decided a long time ago. When employees really don’t like their jobs, they rashly decide on things and then leave. If you would be in this situation, it’s better first to find a replacement job before actually quitting. If one’s health cannot keep up with their work, then it’s time for one to quit. It could either be a work-induced health problem or an already existing health problem that just got worse. 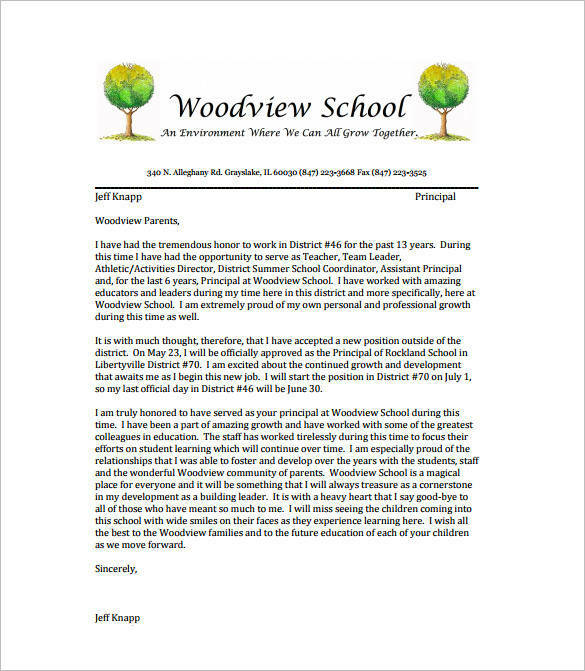 You may also like sample professional business letter templates. Not all people favor changing work schedules. Some of them think that it is fine but in the long run realize that it’s not working for them, so they decide to quit. This is common among the female members of the workforce because they will have to nurse the baby and take care of the family. The father works to provide for the family and the mother stays at home to take care of the children. This is a common setup among newly formed families. You may also check out complaint letters in pdf. When employees find it hard to keep up or adjust with their work environment, this is a time when they decide to resign. It is just not worth it if you are not happy with it anymore. Another common reason for resigning is to pursue a higher level of education. Some employees who can afford to study without being employed decide to leave and follow their dreams. Working abroad has been and will always be the dream of a lot of people. Everybody is just so looking forward with the opportunity to work and travel in a different country. You might be interested in personal letter formats. If the job or tasks an employee does is too heavy for the salary they are getting, this gets them motivated to find another job and resign from their current employer. Regardless of who this family member is, this reason is still a valid reason for resigning, especially with employees who have close family ties. It could be a regular retirement or an early retirement. People who reach their desired retirement age submit their retirement resignation letters to their employer. And when you really feel like it it is really time to quit, do it. Sometimes following these gut feelings will lead to unexpectedly good things. There are actually more reasons why people resign and that there is an endless number of resignation letter samples that you can find online. If you are interested to know what the other reasons are and how they are stated in every resignation letter, then the best thing for you to do is to check out the samples on our website, like work resignation letter samples, board resignation letter samples, and resignation letter format samples that you might want to check out. How Many Days Notice Should Be Provided in a Resignation Letter? Giving notice is one of the main reasons why a resignation letter is required for any employee who wishes to resign or leave their current positions. Every resignation letter should provide a number of days’ notice before the actual effective date of an employee’s resignation. How many days’ notice should you give your employer? For most employers, 30 days notice is the most appropriate and acceptable. This allows any employer to prepare all the needed documents and at the same time give them enough time to look for a replacement, especially if the employee has a certain position in the company. A two weeks notice is also a good notice period if a 30-day notice cannot be guaranteed by the employee. This is all good with the appropriate reasons. There are also instances when an employee must really provide an immediate resignation letter due to enforceable reasons. Although a lot of companies discourage their employees from going on immediate resignations, there are times when they have to accept it if the reasons are also reasonable and acceptable. Resignation letters are not just about the reason/s why you are resigning. They are formal documents, so you should also know the proper way of writing the entire document. Here are some tips that can help you write your resignation letter effectively. You may also see official letter formats download for free. 1. Take note of the letter format you are following. 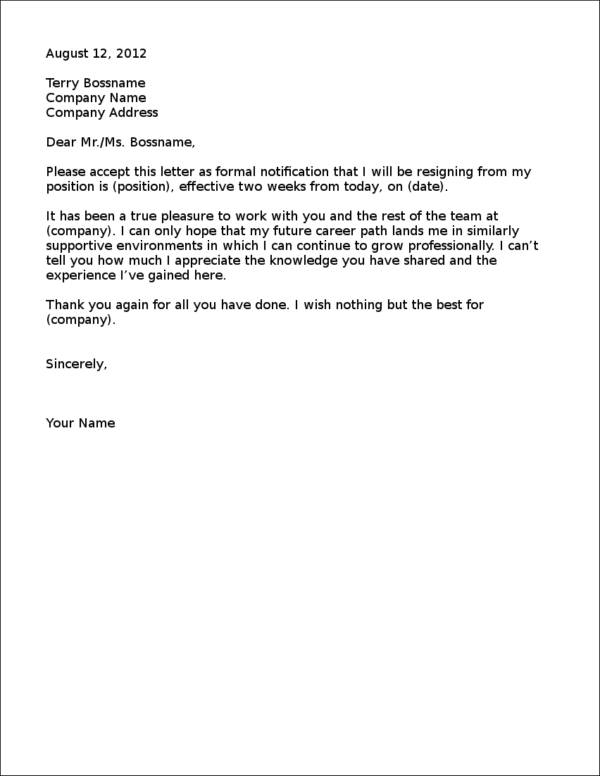 Resignation letters are always written using the formal letter format. 2. Make your letter look more professional by adding a letterhead bearing your name, address, and contact details. 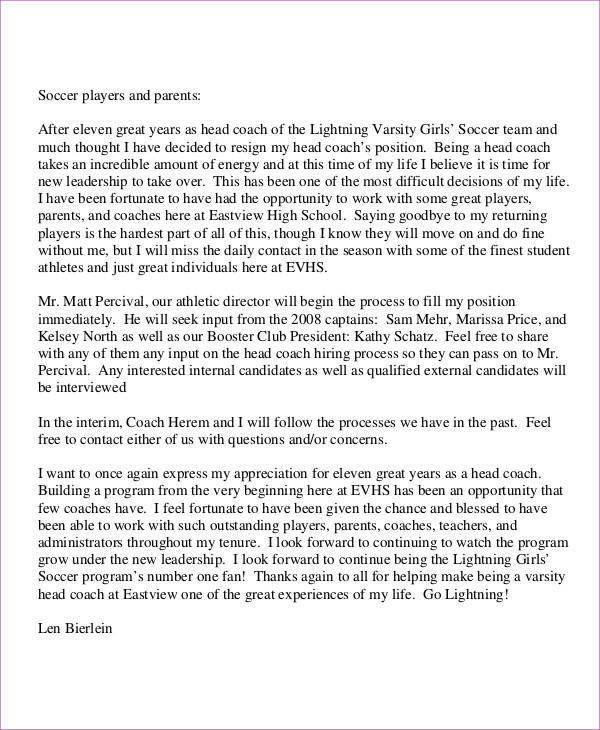 This should be written on the top center part of your letter and should be in a font size that is bigger than the rest. 3. Use the same margin size for all sides of your letter to give it a framed and neat look. 4. Always write clearly and concisely. 5. 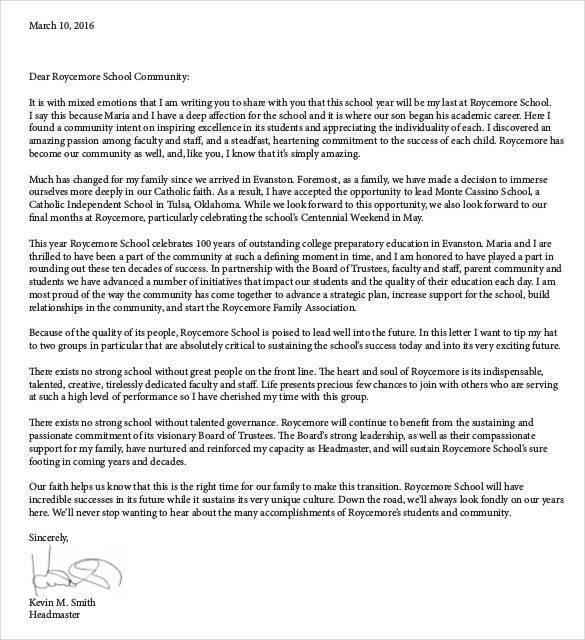 A resignation letter without reason is acceptable, but it would be much appreciated if you provide the reason for your resignation. You may also like suggestion letters. 6. Never say rude words in your letter, and don’t even think about sounding rude or sarcastic. Remember to always be polite even if you really hate your employer or the company. 7. Provide a notice period at all times. 8. Keep a good relationship with your employer even when you are about to leave the company. Who knows when you will need their hep in the future. Being polite pays off. You may also check out motivation letters to download for free. 9. Offer help to make the transition go as smoothly as possible. Your employer will appreciate every bit of help you can give them. 10. Provide the best possible ways to contact you as well as the best times when you can be reached in case they need to. You might be interested in sample hr letters. 11. Never forget to write your name and affix your signature at the signature block of your letter. You are sure to make an effective and wonderful resignation letter if you follow the tips we have provided above. We do hope that you find this article helpful. If you do, we have other sets of articles on our website that you will also love. 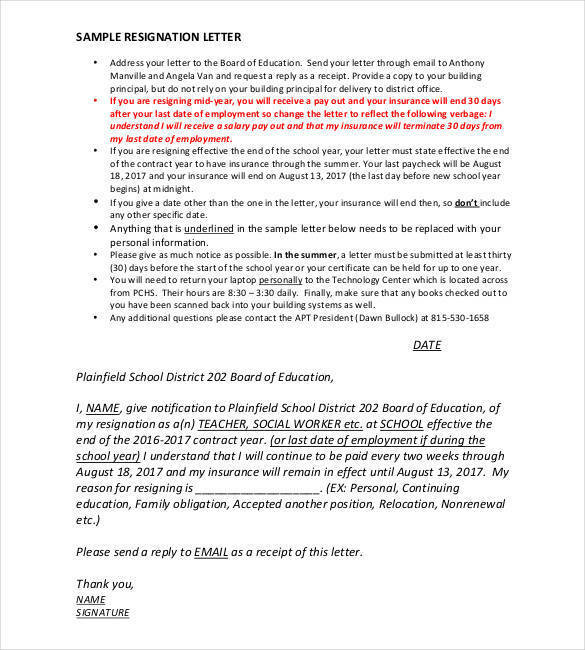 Some examples you might just be interested in are official resignation letter samples and templates, nurse resignation letter samples and templates, and teacher resignation letter samples and templates.